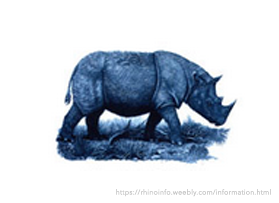 Rhino are a keystone species that influence the ecological environment around them. Every day while you are at work, a rhino will be poached. Every morning when you wake up, another has been killed. We are losing our rhinos not by the day – but by the hour. Every eight hours another rhino is killed. Each cow may have been pregnant, or has left a calf to survive without its mother. Each bull may have been in in his prime to breed. As a healthy breeding pool is diminished and population numbers decrease, the point of no return becomes closer and closer. We have the power to turn the tide on poaching, but we must work together. And we must never give up hope. be extinct in the next 20.
diamonds per kg on the black market. 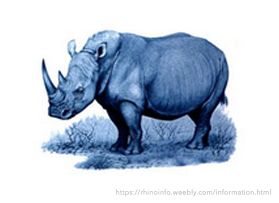 The ice age, prehistoric hyenas and giant crocodiles ... over the last 50 million years rhinos have braved extraordinary things. They were once the largest animals on land. They are built to survive. But now, at the hand of man and the violence of poaching rhinos are critically endangered and exist in limited geographies. The Southern white rhino, AKA the ‘square-lipped rhino’ was once on the brink of extinction with only around 50 individuals left in the wild. Numbers are now between 19,666 and 21,085. White rhino are ‘grazers’ and use their flat, square lip to cut and eat grass and ground vegetation. They have poor eyesight, but acute senses of hearing and smell. Black rhinos are typically solitary in the wild. They are the shyer and more aggressive of the two African species and spend most their time in thick bush where they can hide. They are more active during the night and do most of their foraging and drinking then. There are between 5,040 and 5,458 individuals left in Africa. 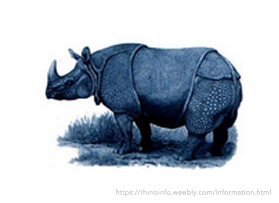 There are approximately 3,550 greater one-horned rhinos left in the wild. They are good swimmers and have the ability to dive and feed underwater. Their unique 'armour-plating' appearance and a prehensile upper lip similar to the black rhino, assists in foraging. They feed on wide variety of plants — up to 183 different species. “The hairy rhino” has been on earth longer than any other living mammal but today there are fewer than 80 individuals left. 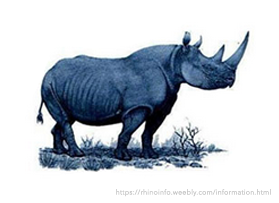 They are the smallest of the five rhino species and also the fastest and most agile, able to climb mountains and riverbeds. Although, they tend to spend their days sitting in pond or mud wallows to keep cool. 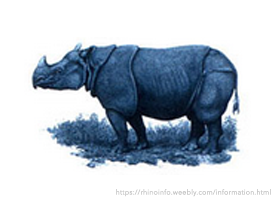 Only 58-68 individuals are left in the wild, making the Javan rhinos the most threatened of the five species and also the rarest large mammal on earth. Today, they only exist in Ujung Kulon National Park in Java, Indonesia. Also known as ‘The lesser one-horned rhino’ the Javan rhino is more likely to run away from an enemy than attack.